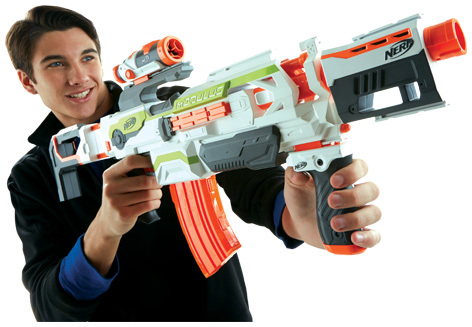 Hasbro’s Nerf N-Strike Modulus ECS-10 Blaster is one of the most customisable Nerf weapons ever created! Featuring thirty different ways to create your own unique blaster, the impressive list of parts is quite amazing. These include the main stock with storage for ammo clips, a precision sighting scope, a drop-down hand grip, dual rail barrel and even extra tactical rails to improve efficiency and accuracy. A ten dart banana clip that’s complete with a supply of N-Strike Darts is also part of the set. Further upgrade parts are also available as well as supplies of ammo that can soon run out! Nerf N-Strike Modulus ECS-10 Blaster is a great action toy for kids of 8 and over and joins many other Nerf products available from all good toy stores. Please tell us what you think of the Nerf N-Strike Modulus ECS-10 Blaster by NERF and Hasbro.